Witness the event daily - Close up ! There is no doubt that this regular feeding has helped the Red Kite breeding population maintain it's stronghold in the Llanddeusant and surrounding area and, indeed, increase its numbers. 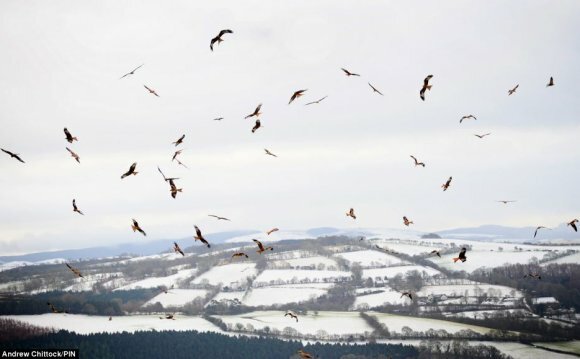 In Wales 20 years ago there were less than 30 breeding pairs of Kites but now, with careful management and protection, there are now well over 300 pairs ! The feeding centre is very near the charming town of Llandovery where there are plenty of hostelries, cafés and shops. From Swansea ( A4067) - Travel to Sennybridge and turn left onto A40 towards Llandovery. Follow directions as from Brecon. From Brecon (A40) - Travel west on A40 towards Llandovery. At Trecastle turn left at Castle Hotel towards Llanddeusant. Follow road for approx 9 miles past turning to Usk Reservoir and over two cattle grids into Llanddeusant. Turn right towards Myddfai near the camping park. Feeding centre 200 yards on right. Parking is provide nearby. From Carmarthen (A40) - Take A40 to Llandeilo, then towards Llandovery. Approx 6 miles from Llandeilo turn right onto A4069 into the village of Llangadog. In village take right turn toward Brynamman. Follow road until you see the Three Horse Shoes (no longer a pub ) and turn left over river towards Llanddeusant. Follow road round to right through the hamlet of Twynllanan and on into Llanddeusant. Turn left towards Myddfai. Feeding centre 200 yards on right. Parking is provided near the feeding centre. We do not sell tickets online as you do not usually have to book. The Red Kite Feeding Station is big enough to cope with most group sizes but if you are unsure please contact us. The hides are designed to accommodate disabled access if required. To purchase your tickets please simply visit the Red Kite Feeding Centre just prior to the feeding time. Allow yourself 30mins before feeding starts. The Red Kites are fed daily at the same time. Please be at the centre in time to take your place in the hide and ready for the feeding start time. Red kites(milvus milvus) at Blwch yr Nant Arian Forest,Wales.